Staying on a budget can be difficult for many people. This is especially true, if there are no records of what was spent and why. This Expense List template is a simple, but effective tool that can help anyone manage their finances. It will require little effort to utilize, but will reveal a wealth of information to you, when trying to stretch your paycheck a little further. First, at the top of the spreadsheet, on the right side, you enter your total budget. This is the money you have been available to spend. As the money is spent, a total of the expenditures will show up at the bottom of the column. At the same time, the second number at the top of the spreadsheet will reveal how much is left to spend. There are several fields of data to enter, but each column is self-explanatory, but includes the date, description of the expense, the purpose, method, an additional explanation if needed and finally, the amount that was spent. The spreadsheet can be used on a weekly, monthly, quarterly or even yearly basis. The period of time that is track depends on the time frame for which you want to track expenditures. If you do it weekly, just start a new expense list each week. After a few weeks, comparisons can be made and the appropriate action taken. 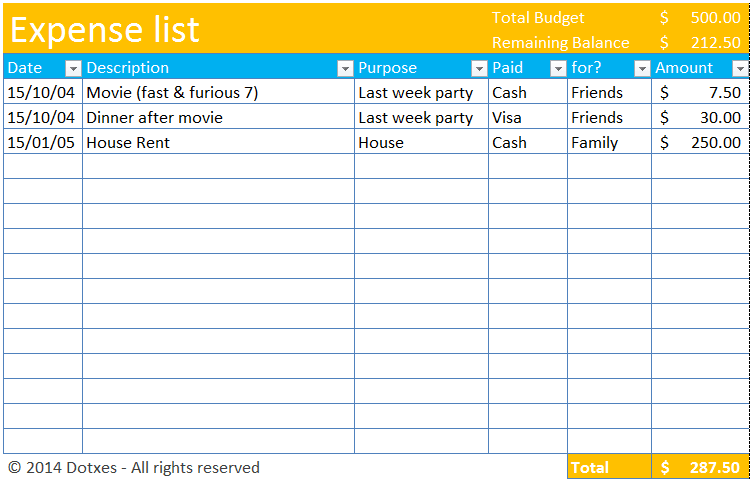 Created in Microsoft Excel®, the Expense List template should run on almost any computer, tablet and many smart phones. Thus, you can enter your expenditures when they take place. This simple to use document can help many people keep better track of their expenditures, determine where they can cut costs, and how much they can save. Simple and straightforward, the Expense List can be a valuable tool for individual, club or family budgeting. The template may be downloaded at the following address free of charge. Loved that its simple but captures everything I need. Great template!! I am thankful for someone taking time to create them. I tend to think of great templates but then get too distracted with minor changes.